Enjoy some Easter fun out at campground with some Peeps Campfire S’mores. Easter is coming up and the store shelves are full of all kinds of fun candy. I picked up some cute pink marshmallow Peeps and a chocolate bunny to put in a camping-themed Easter basket that I made for my daughter. 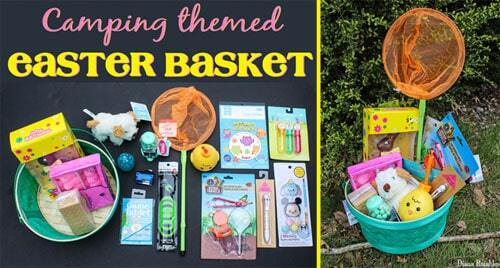 How fun would it be to make S’mores with Peeps and a chocolate bunny? 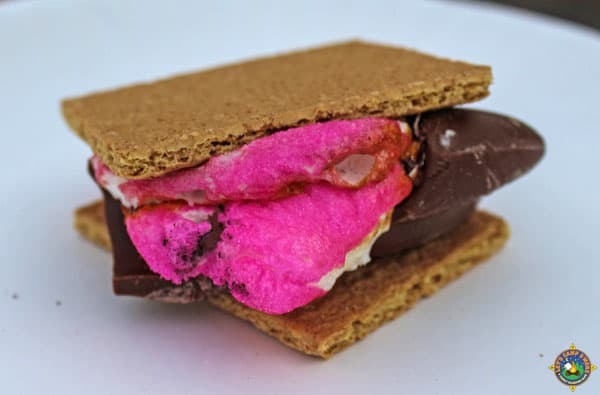 Make some Peeps Campfire S’mores for yourself! Everyone loves S’mores! They are a favorite campfire treat by young and old alike. Traditionally they are made with regular marshmallows, chocolate candy bars, and graham crackers. I substituted Peeps for the marshmallows and a hollow chocolate bunny for the candy bar. See how easy it is to make S’mores with Peeps. These campfire treats are super simple to make. 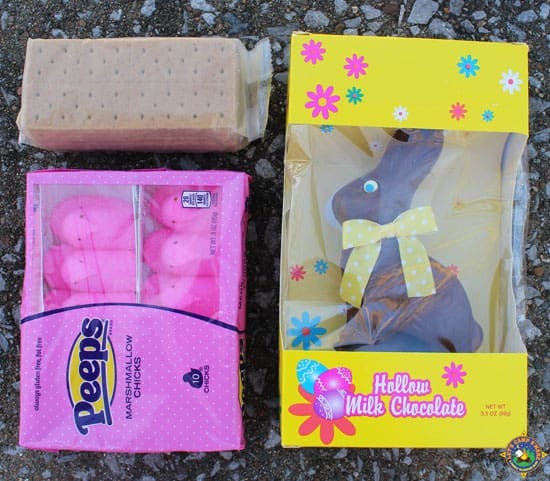 You just need Peeps, a hollow chocolate bunny, and graham crackers. 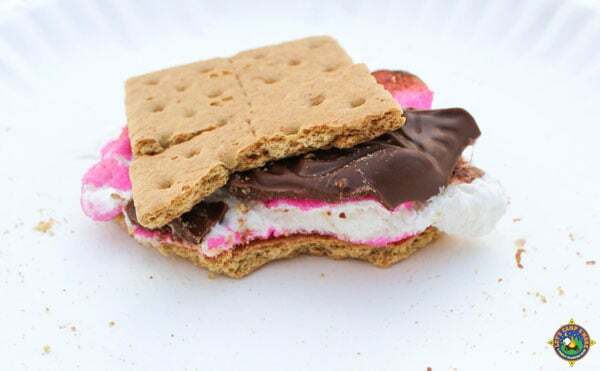 Get a s’more ready by breaking up the chocolate bunny and placing a large piece of it on half of a graham cracker. I like to prep them on a paper plate ahead of time. It makes for a quick clean up! 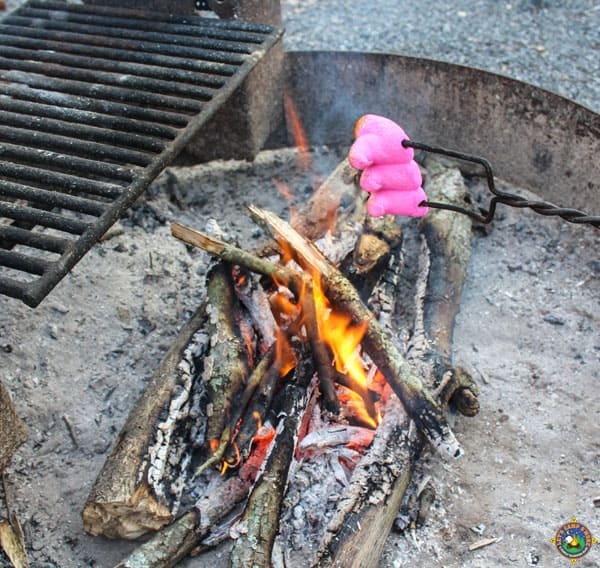 Roast a Peep or two over the campfire, just like a traditional marshmallow. Roast to desired crispiness. Carefully remove the Peep from the roasting fork and place on top of the chocolate. Place another half of graham cracker on top of the Peep to complete the s’more. How fun is that? We enjoyed roasting the Peeps over the fire. My daughter is a budding scientist and had to drop on into the fire to see it burn. She also enjoyed seeing the sugary coating of a Peep change form on the roasting fork. Peeps are now made for various holidays throughout the year. They have a long shelf-life, so you can buy some Easter Peeps to roast on your next camping trip. You can also purchase Peeps Minis year round. Have you ever roasted a Peep? Enjoy this Easter spin on a traditional s'more. Break up the chocolate bunny and place a large piece of it on half of a graham cracker. Toast a marshmallow Peep or two over the campfire to desired crispiness. What a great idea for a campfire smore and thanks so much for sharing them with us at Full Plate Thursday. Hope you are having a great week and come back soon!